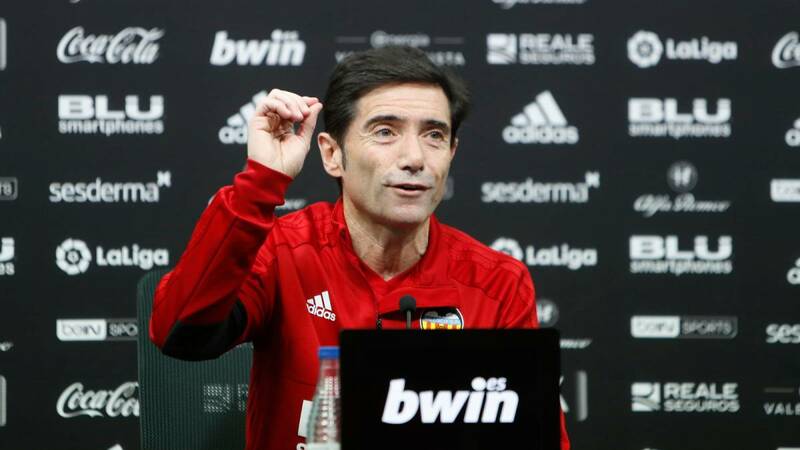 Home Soccer Marcelino: "The logic says that Batshuayi is going to leave Valencia"
Marcelino: "The logic says that Batshuayi is going to leave Valencia"
Marcelino is left to Michy Batshuayi, with whom he does not count, off the list; he will not travel to Vigo Rubén Vezo either. Piccini is already recovered. Batshuayi is still in Paterna, if he stayed in Valencia, he would play again and see a scenario where he leaves and Valencia does not sign? We are talking about two hypotheses. I think that none of them will be fulfilled. If this were to happen, Batshuayi is an asset and we would have to optimize that performance. But I think that this is not going to happen because it does not interest any of the parties. Neither the player nor Chelsea or Valencia. I think an agreement will be reached. The club is working on the incorporation of a footballer, which is possible to reach the end of the market. If it did not arrive would be a setback because we would miss a piece and it would be an added difficulty. ¿Alemany and Murthy have transmitted sensations of Lim? He had conversations with both and they have transmitted absolute tranquility. The logical dislike for the results, as we all have. There is a sense of concern because the results are not as expected, it is logical, otherwise it would be unprofessional. From here, I do not notice anything different from the treatment received from the first day in Valencia. The competitive level of the team in most matches is high. We have to solve our efficiency face to door. Visita Balaídos, the tie does not serve ya. Vamos with the illusion of winning. We come from two consecutive games in which we did two good second times. We play against Celta that is needed and at the same time has a great efficiency in attack, but also problems in defense. Our idea is to win. We start with that illusion. The level of commitment is high. Efficiency in the areas will define. Summer 18 years on the benches, is this the wardrobe that most believes in you? 18 years are many. When a coach has 18 years or achieves good results, I think that, in many cases objectively above the expected, it is because he has had many related templates. At the beginning when I was a non-professional coach I understood that the coach had a very high importance and some trainer attack I had. But football is the footballers and throughout this process I have been adding experiences and I want to thank almost all of the staff because they have believed in our proposal. Anyway, I would like to thank this staff for the behavior they are having with this coaching staff, because in a club with so much difficulty in the environment ... it is easier for everything to be divided and here it has not happened. We are very grateful to these players. Do you think the situation of Batshuayi can complicate the relationship until his departure? I do not think that Michy's situation has an influence on the dressing room because everything is very clear there. I have no doubt. How do you see the Cup already without Atlético? Maybe they will not throw it away? We do not throw the Cup in the trash. Anyone who sees the team's game, attitude, behavior ... the players will not throw anything away. It is true that the approach of the club is to establish a priority. That priority today due to circumstances is the League. It would not be wise for us not to distribute our efforts, first because everyone works to play and secondly because we would charge the players. We continue with the same idea, we prioritize the League, but in no case we will throw the Cup. Do you think that a match like on Tuesday will give confidence to Ferran ?, and how do you see young kids in this complicated situation? Ferran played a 180 'eliminator and made 45 extraordinary. It is going to suppose a high of self-esteem and for the club and technical body it was a joy. From here, you do not have to generate a star for a match, because it sure was going to harm you more than benefit. He is a young player, like Kang-in, who needs to take short but sure steps and it would be a dare for us to download a pressure on them. You have to give normality and among all, their immediate environment, the player himself and the coaching staff help him grow. You have to climb a ladder step by step, not four steps at a time. To the soccer player it is necessary to transmit security and tranquility. We see conditions, great, but taking the right steps will become an important club for a footballer like Valencia. Se you see the exit of Batshuayi? I think you have several solutions or market possibilities. As is logical, the player will have certain preferences and the club owner of their rights, others. Before the end of that period, a solution will be sought. I believe in logic and it leads me to think that this situation will end Michy in the place whereall the parties want. I have no information that the solution is close. Pellegrino declared yesterday that Chicharito is still important to him. Is it an option for you? He's a West Ham player and if his coach says that, I can say little else. Also is not a player who is in my squad. Do you have a preference in the Cup and what do you think about the Chumi case? I do not have any preference because even if I had it, it would be the opposite. And I do not have enough data to comment on what has happened to Barcelona. It is to the RFEF that I would have resolved it. We wanted to have Fran Navarro for Sporting. We made an inquiry because he had been expelled in the Youth Cup and we were discouraged from doing so. The situation of Celta invites you to propose a more conservative party than usual? We propose the matches according to how we think we can win it . We make an approach for when we have the ball and another when we do not. We always seek to attack the rival goal. We play against a team whose numbers are clear. Second team with more goals in favor and in turn a team that fits. We must defend very well and in turn have definition. We will have chances to win if we have a high level of efficiency in defense and if we are able to generate the chances we are having away from home. The team is ok.
Who would throw a penalty in Balaídos? In this team there is a first manager and then there are other players who can also throw it. Last season Santi Mina executed a penalty and this year also Rodrigo. It depends on the players agreeing. Nothing has changed. And can you launch another one that is not on that list? You have to analyze the situation and the moment. But for me if there is agreement, there is no disadvantage.